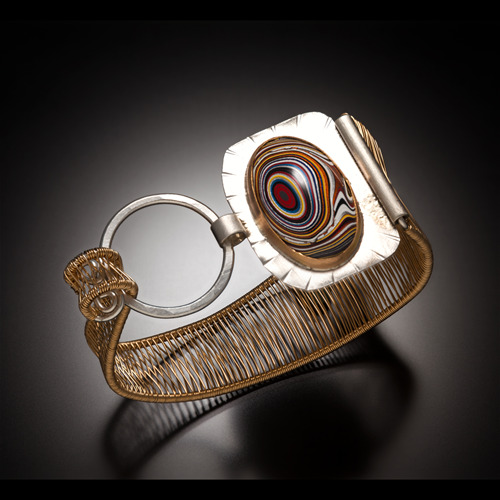 Original Sin Jewelry offers two lines, Woven Geometries and Singularities. The shapes of the WG have powerful positive mantras, offering patrons a connection to the work beyond just looking and being beautiful. Each piece comes with a Mantra Card, so customers can spread positive messages through gifting or celebrating important milestone acheivements. 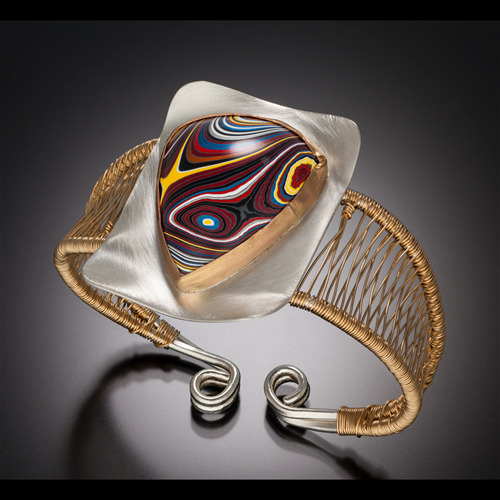 Singularities offers patrons beautiful, luxurious contemporary jewelry with an elegant and sophisticated point of view. 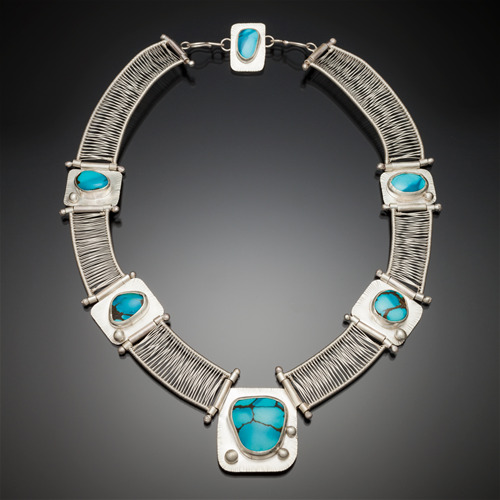 Currently much of Singularities is crafted with natural, US Turquoise; however, custom collections can be designed for your specific needs. 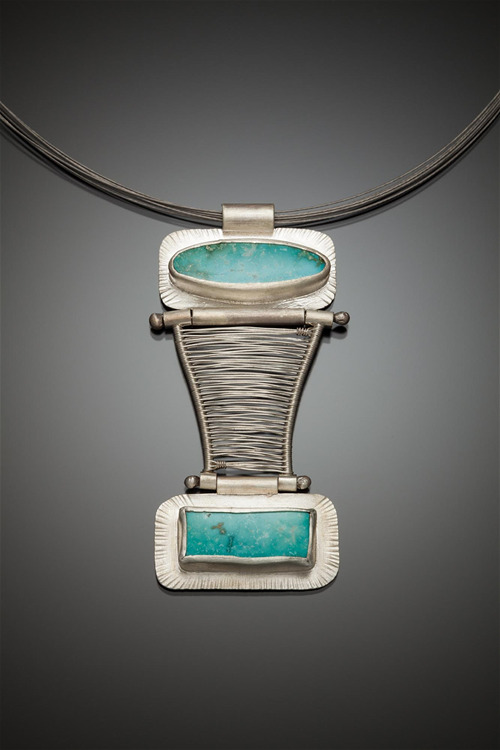 Ultimately, Original Sin Jewelry encourages patrons (both wholesale and retail) to be Satisfied, Conscious, and Authentic. If these values are your values, stop by booth #1732 for a 15 minute introduction to Original Sin Jewelry. Trident- One each of 4 Precious Metal Choices in both Necklaces and Earrings. 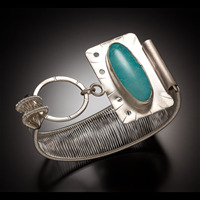 Contemporary Asymmetrical Woven Fine Silver Cuff shown in Natural US Turquoise and mixed metal Silver/14k GF with Corvette paint cabachon. This style is easy to size in the retail setting by rolling the end up or down. Various stones and metals available and a collection can be customized to fit your needs. 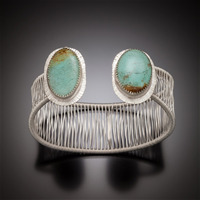 Contemporary Cuff with Natural US Turquoise set in Fine Silver with a Woven Fine Silver Band. Also shown Corvette paint Cabochon with mixed metal silver/14k GF. I generally create these in small, med and large. Various stones and metals available and a collection can be customized to fit your needs. Topsy Turvy Not Matched Hinged and Woven Earrings shown in Natural US Turquoise set in Fine Silver. 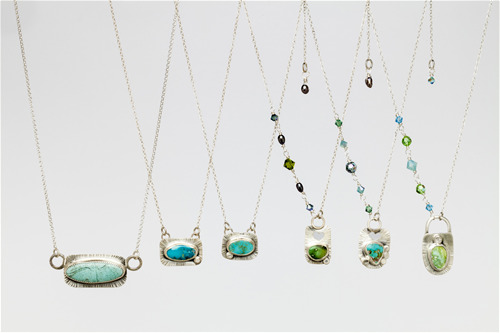 This series is available in an endless variety of stones and a custom collection can be crafted for your store. Mixed metals are also available and pricing will vary depending on the Custom Collection we design for you and your customers. 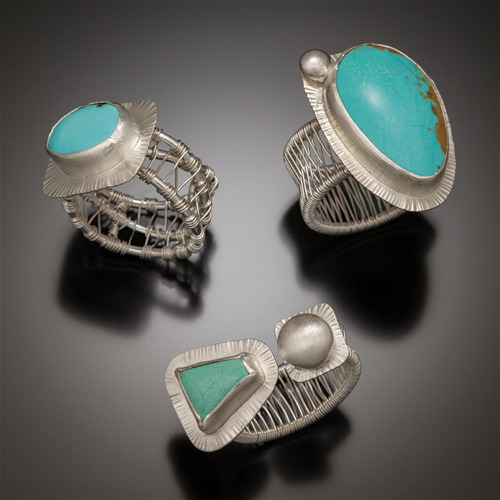 Natural US Turquoise Ring set in Fine Silver with Nest Style Fine Silver Band. These rings can be adjustable or created to size and can be custom ordered by you for your customers. Various stones available and metals available. Would be a beautiful addition to a customized collection. 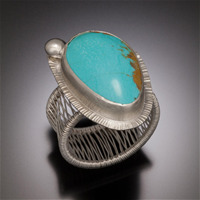 Natural US Turquoise Ring set in Fine Silver withWoven Fine Silver Band. These rings are adjustable and can be custom ordered by you for your customers. Various stones available and metals available. Would be a beautiful addition to a customized collection. 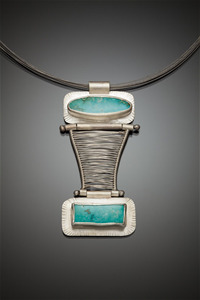 New Contemporary Hinged and Woven Pendants shown here in two stone Turquoise set in Fine Silver. These come on a 16” or 18” cable in Steel or Black. 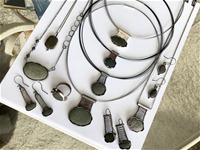 Various stones and metals available and a collection can be customized to fit your needs. These are also available in Small, Regular and Bold sizes and will appeal to a broad range of customers. 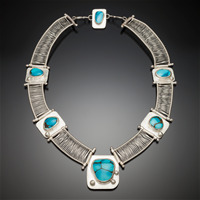 Six Stone Hinged and Woven Neck Piece shown in Natural US Turquoise set in Fine Silver. 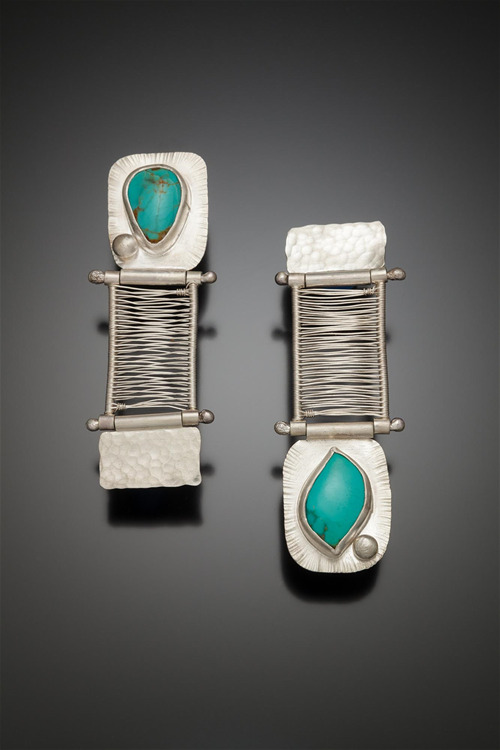 These pieces are available only in the finest stones and for the most discerning customers. 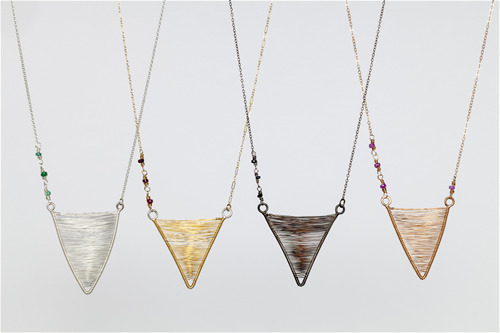 Mixed metals are available and a custom collection can be crafted for your store. Pricing will vary depending on the Custom Collection we design for your high end, sophisticated customers. Various Silver and TQ Pendants. Shown in Balance, Open Heart & Guiding Light Styles. The right side is beaded so the Heart (left side) remains Open. Not shown are Focus and Bridge styles. Each piece ships with a Mantra Card for your patrons. Avaialable in a wide range of TQ mines as well as other stones. Let's talk! Shield- Protect your Positivity: This lightweight and elegant Shield necklace is available in three sizes and two lengths. All silver, 14k Gold or mixed metals available. Earrings and Necklaces to mix and match and coordinate available. Beach Rock Jewelry available in a variety of styles. Is your shop by the ocean or on a lake? I can create a custom collection for you using the stones, shells and material from your home town or area. Stop by booth #1732 to talk it through and place an order for your Custom Hometown Collection! 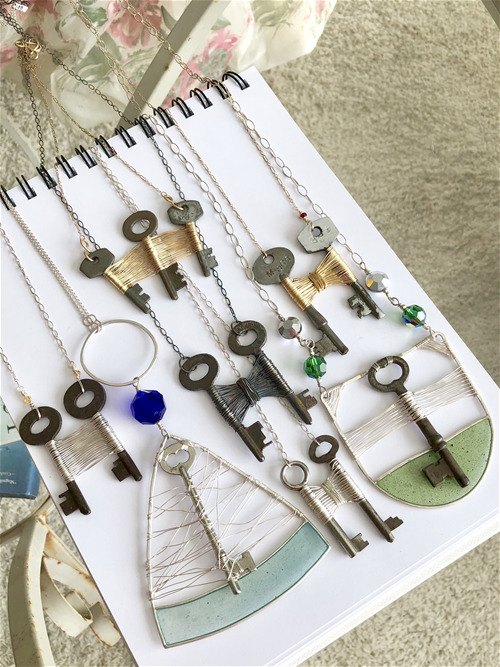 Skeleton Key Jewelry available in a variety of styles. Do you have a cool collection of keys and think they'd be great to sell in your shop? 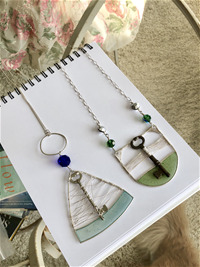 I can create a custom collection for you using the keys and materials from your home town or area. Stop by booth #1732 to talk it through and place an order for your Custom Skeleton Key Collection!